Swarovski crystals are glitzy yet affordable and currently Swarovski offers more than 100,000 different shapes, colors, sizes, and facet styles, and their collection now includes more than 50,000 different articles. ~ The word crystal is based on the Greek word krystallos, derived from kryosk, meaning icy cold. ~ Performer Liberace had a piano encrusted with Swarovski crystals. ~ Marilyn Monroe wore a skin-tight evening gown dripping with 6,000 Swarovski crystals while singing "Happy Birthday" to John F. Kennedy at Madison Square Garden in 1962. This dress fetched $1.2 million at a Christie's auction in 1999. ~The replicas of the British Crown Jewels are made with Swarovski crystals. ~ Swarovski was also a sponsor for The Phantom of the Opera (2004 film), in which the "standing model" of the chandelier was composed of Swarovski crystals. A Swarovski shop window is also visible later in the film. I honestly don't know if I could even make a guess at my current Swarovski inventory -that's how big it is! Although I will admit I do remember most of the items listed above that used Swarovski crystals -guess that is what made them so memorable in the first place. Which is why virtually all my jewelry designs incorporate Swarovski crystals in some way, or are entirely made using them. Where do the days go? I love the month of February for two reasons. The first is because I hold a special preference for amethyst jewelry (being a February baby myself) and of course there is Valentine's Day. I've been so busy working extra hard to get additional features on the website store for you. Just about all of the earrings now have a customization feature on them. Necklaces are next and then bracelets. It's an arduous task but one I enjoy because I know how much I love to customize my jewelry and now I can offer you the same. This new feature makes Crystal Allure Creations unique to other online designers. It's jewelry -your way! One task always weighing heavily on my mind is better quality pictures -really, I promise they are forthcoming! Now, the reason for my post. Valentine's Day. Who says you have to wait for someone to buy a gift for you. 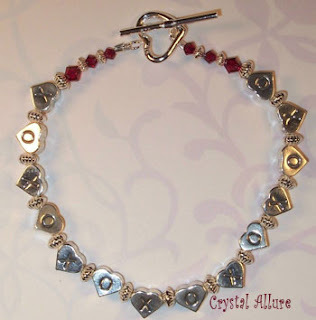 Get your special piece in advance, while supplies last, at Crystal Allure Creations. To make it easier to find all these adorable and sparkling treasures of love, I've set them apart from the rest of my pieces. You can find everything available for this lovely day under the "Valentine's Day" link in the menu. Just look at the beautiful Hugs n' Kisses bracelet above! If you want a head start on February birthday gifts -check out the Double Classic Petite Crystal Earrings. And as always, don't forget while you're there to check out the February Sale -new items have been added.